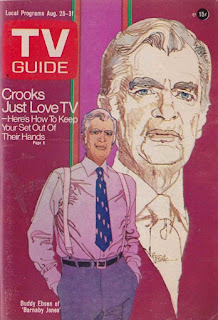 Barnaby Jones was a retired private investigator who left the business to his son Hal. When Hal was murdered while working on a case--he was shot to death while calling his dad--Barnaby came out of retirement and along with Hal’s widow, played by Lee Meriwether, solved Hal’s last case and caught his murder. They worked well together and they decided to keep the Jones detective agency open. Like Columbo, many crooks mistook his home-style country ways and his age as making him seem a bit slow. They really masked a keen detective mind. Their mistake gave Barnaby the upper hand in solving the crime. Later Mark Shera, formerly on the show S.W.A.T., [joined the series] as his young cousin Jedediah Romano (“J.R.”) Jones. He did Barnaby’s legwork on investigations while also study[ing] for the bar to become a lawyer. He was a welcome addition to the cast, but it always seemed funny that J.R. would chase the crook through half the city. The only way he caught the crook was when Barnaby would show up, gun in hand, at the end of the trail. He usually said “Hold it right there!” With Barnaby in front of him with a gun and J.R. coming up from behind, the villain knew he was cornered and gave up. When the show Cannon was on the air the two shows would often cross over. Despite his absence from the festivities, we’ll drink a toast today--appropriately, with milk--to Buddy Ebsen for his TV crime-drama contributions. By the way, if you’re feeling as nostalgic as we are right now, pay a visit to the Absolute Barnaby Jones site, or click below to watch the pulse-quickening intro sequence to Barnaby Jones. READ MORE: “Hand Me Down My Walking Cane: Old Dicks,” by Kevin Burton Smith (The Thrilling Detective Web Site).